Despite the implementation of remittance and travel restrictions (RTRs) by the Bush Administration on June 30, 2004, and the replacement of the U.S. dollar (USD) with the convertible peso (CUC) by the Cuban government in October of that year, family remittances continue to play a key role in the Cuban economy. During the 2001–2006 period, remittances to Cuba increased 27.5%, from $730 million in 2001 to an estimated $931 million in 2006, representing an annual growth rate of 5.5% (Pérez-López & Díaz-Briquets, 2005; González-Corzo & Larson, 2006; International Fund for Agricultural Development [IFAD], 2007). In 2001, remittances represented 45.4% of the value of Cuba’s merchandise exports, and 43.1% of the gross hard currency receipts generated by international tourism. By the end of 2006, the ratio of remittances to merchandise exports declined to 33.7%, mostly due to an increase in Cuba’s export capacity; however, the ratio of remittances to gross receipts from tourism remained virtually unchanged at 43.5% (Anuario Estadístico de Cuba (AEC), 2006). A recent World Bank report titled Remittances and Development: Lessons from Latin America, shows that remittances are directly linked to lower poverty levels, improvements in education, and better health indicators in receiving countries (Fajzylber & López, 2008). Remittances also contribute to economic growth and investment, and are associated with lower levels of macroeconomic and exchange rate volatility (Fajzylber & López, 2008). At the microeconomic or more precisely the household level, remittances also play a critical role in the economies of the receiving countries. The mentioned World Bank study also found that for each percentage point increase in the ratio of remittances to gross domestic product (GDP), the share of the population living in poverty in the home country is reduced by an average of 0.4% (Fajzylber & López, 2008). Remittances also have a positive impact on bank deposits and the mobilization of credit in receiving countries. According to the World Bank, a 1% point increase in remittances results in approximately 2% to 3% increase in bank deposits and credit in receiving countries (Fajzylber & López, 2008). Given the importance of remittances in the Cuban economy, and despite the critical role that U.S. based remittances forwarding agencies play in facilitating the transfer of these unilateral flows of private capital, very few studies have focused on these agencies, which are vital components of Cuba’s “remittances market.”2 To address this gap in the literature on remittances to Cuba, this study examines the principal characteristics of U.S.-based “bricks and mortar” remittances forwarding agencies serving Cuba, with a particular emphasis on their geographic concentration, their product and service offerings, the transaction costs associated with these products and services, and the amount of time required for their delivery to Havana and other parts of the island. To achieve this objective, we compiled a list of remittances forwarding agencies (RFs) operating in the United States serving Cuba. Upon completion of this list, we conducted a longitudinal survey, which was used as the primary tool to gather data for our study. We employed a purposive approach to the selection of the sample. All the RFs included in our survey were authorized to provide remittances forwarding services to Cuba, operated in the United States and its territories, and functioned as a “bricks and mortar” operations (i.e., had a physical location such as a branch or office, where customers can go in person) rather than a Webbased money transfer organization (MTO). We conducted a total of 88 surveys or interviews. Whenever possible, the survey included face-to-face (or in person) interviews with the employees or representatives of the RFs included in our study. This type of fieldwork required multiple visits by the authors of this study to 15 RFs in Miami and Hialeah, Florida, and West New York and Union City, New Jersey. The rest of the surveys or interviews (73) were conducted over the telephone. The data were collected over a six-month period spanning from October 1, 2007 to April 30, 2008. At the end of the survey period, we conducted a post-survey validation, involving callbacks or revisits to 25% (or 22) of the sampled companies. In percentage terms, more than three-quarters of the RFs serving Cuba in the U.S. at the end of 2006 were located in Florida (76.1%), and the rest were located in states and territories with relatively large concentrations of Cubans and Cuban-Americans, such as California (6.8%), New Jersey (5.7%), Puerto Rico (3.4%), and New York (2.3%). 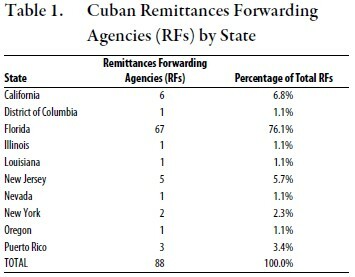 Figure 1 shows the distribution of Cuban remittances forwarding agencies (RFs) by state, and their corresponding share of the total agencies registered in the United States at the end of 2006. One interesting finding from our research is the fact that there are no agencies registered in Texas, even though at the end of 2006 approximately 2.4% of the Cuban population in the United States lived in the Lone Star State, and Texas was ranked fifth in terms of its share of the U.S. Cuban population (González- Corzo, 2007). Another rather surprising, and interesting, finding was the relatively small number of RFs located in New Jersey (5), given the Garden State’s traditional role as a principal destination for Cubans residing in the United States. 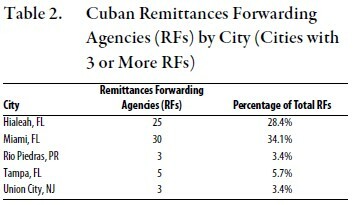 Table 2 shows the concentration of Cuban remittances forwarding agencies (RFs) in the U.S. and Puerto Rico by city, for cities with three (3) or more agencies. The U.S. cities with the largest share of RFs were: (1) Miami (34.1%); (2) Hialeah (28.4%); (3) Tampa, Florida (5.7%); and (4) Union City (3.4%). We used a linear regression model to analyze the relationship between the geographical concentration of the Cuban community in the United States and the concentration of RFs. 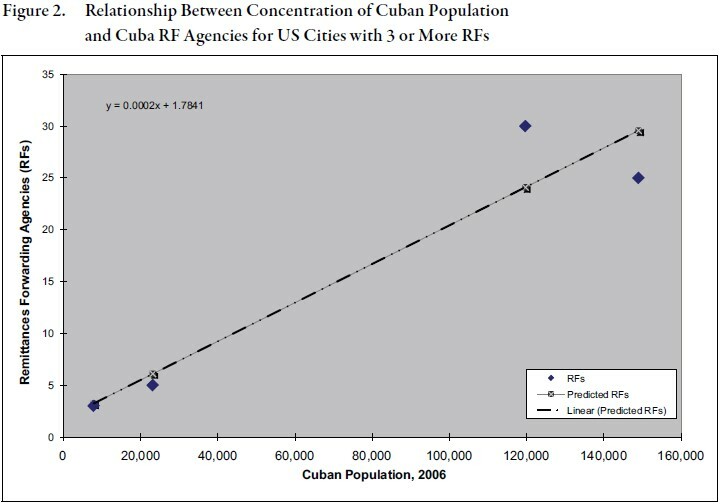 The number of RFs in U.S. cities with three (3) RFs or more was defined as the dependent variable, and the Cuban-origin population as the independent variable.3 As expected, our study found a strong (positive) correlation between the concentration of the Cuban community and the concentration of agencies authorized to send remittances to Cuba in the United States (see Figure 2).4 Given that approximately 17.7% of the Cuban population in the United States resides in Miami and Hialeah (“American Community Survey” [ACS], 2006), we found a disproportionate concentration of RFs in these historical Cuban (ethnic) enclaves.5 The agencies located in Miami and Hialeah (FL) represented (a combined) 62.5% of the total Cuban remittances forwarding agencies (RFs) in the United States at the time of our study. Our survey revealed that the commissions (or transaction costs) charged by U.S.-based RFs primarily depend on the amount sent. Table 3 presents the estimated costs of sending remittances to Cuban using data collected in our survey. Compared to the rest of Latin America and the Caribbean, Cuban remitters pay extremely high transaction costs (or commission fees). As Table 3 demonstrates, the typical commission fee charged by the agencies included in our study varies in inverse relation with the amount sent. For instance, a remitter wishing to send $50 to a relative in Cuba would pay a commission fee of $20, or 40% of the amount sent. By contrast, if the same person were to send $300 (the maximum quarterly amount allowed under current U.S. law6), he or she would have to pay a commission fee of $25, or 8.3% of the amount remitted. However, given the unique characteristics of the Cuban remittances market (González-Corzo & Larson, 2006), focusing only on the commission fees charged by the remittances forwarding agencies (RFs) understates the real cost of sending remittances to Cuba. Since the implementation of Resolution No. 80 in 2004 and Agreements 13 and 15 in 2005 by Cuba’s Central Bank (Banco Central de Cuba [BCC]), remittances receivers in Cuba are charged a 20% “conversion fee” each time they exchange U.S. dollars for Cuban convertible pesos (CUCs). Technically speaking, the remitter (or sender) incurs this additional cost, which increases the total cost of sending remittances to Cuba. As Table 3 shows, after incorporating the 20% “conversion fee” charged by State-run exchange house, CADECA, the total cost of sending $50 to Cuba increases from $20 (or 40% of the amount sent) to $30 (or 60% of the amount sent). Similarly, adding the 20% “conversion fee” increases the cost of sending $300 from $25 (or 8.3% of the amount sent) to $85 (or 28.3% of the amount sent). 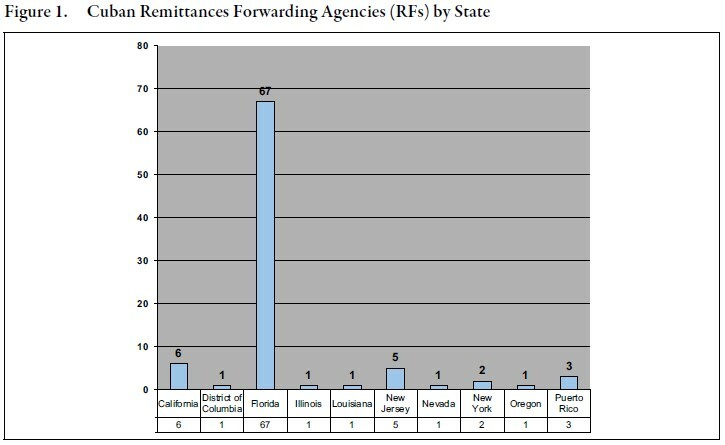 The amount of time that it takes to deliver remittances sent to Cuba using the services of the RFs included in our study varies by destination. On average, we found that it takes between 48 and 72 hours (or 2 and 3 days) to deliver remittances to the City of Havana (Table 4). However, remittances sent to cities and towns located in other provinces, particularly in Eastern Cuba, can take as long as 10 to 15 days to reach their final destination (Table 4). Some of factors that influence delivery time for remittances to destinations outside the City of Havana include: the distance between the final destination and Havana, the relative accessibility of the receiver’s home (rural destinations typically require more than time than their urban counterparts), and the ability of the “delivery person” to secure an effective and reliable means of transportation. Our study examined the principal characteristics of “bricks and mortar” RFs in the United States that deliver remittances to Cuba. In particular, we analyzed their geographic concentration, product and service offerings, transaction costs, and the amount of time required deliver remittances to Havana and other parts of the island. We conducted a total of 88 interviews between October 2007 and April 2008. Although we primarily used telephone interviews, we also conducted face-to-face (or in person) interviews with the employees or representatives of the RFs included in our study whenever possible. With regards to geographical concentration, our survey found a strong (positive) correlation between the concentration of the Cuban community and the agglomeration of RFs in those communities. Not surprisingly, we found that the majority of RFs in the United States serving Cuba (67 out of 88) were located in Florida. The rest were scattered across different cities in the United States and Puerto Rico with a notable presence of Cuban-origin population. The U.S. cities with the largest share of RFs were: Miami 30; Hialeah (25); Tampa (5); and Union City (3). In terms of the types of services offered, we found that 54 out of the 88 (or 61.4%) of the RFs included in our survey currently send remittances to Cuba on behalf of their clients, while 34 (or 38.6%) no longer do so. This was primarily attributed to increased competition, particularly from online money transfer organizations (MTOs), higher operating costs, and more stringent U.S. and Cuban government regulations. With regards to transaction costs, our study found that remitters to Cuba pay relatively high transaction costs compared to the rest of Latin America and the Caribbean. Commission fees for sending remittances to Cuba range from 8% on the low end of the spectrum to 40% on the high end, placing Cuba among the most expensive “remittances markets” in the world in terms of transaction costs. Finally, our study revealed that, similar to other countries in Latin America and the Caribbean and the rest of the world, the amount of time that it takes to deliver remittances sent to Cuba varies by destination, with remittances sent to Havana and its vicinities taking less time than those sent to the rest of the island. 1. During a recent visit to Cuba on January 2008, one of the authors spoke with several small business operators in Villa Clara province. Many of these entrepreneurs relied on regular family remittances to obtain essential inputs from state-run “hard currency stores” (or tiendas de recaudación de divisas—TRDs), and the informal economy. The majority operated privately-owned restaurants or paladares, one or tworoom hostels or casas de huéspedes, and private taxis (taxis particulares). Some of these enterprises were registered or authorized to operate legally, while others operated without official government authorization. 2. A country’s “remittances market” consists of the remittances senders (or remitters), the receivers, and the channels and mechanisms to send and receive remittances. 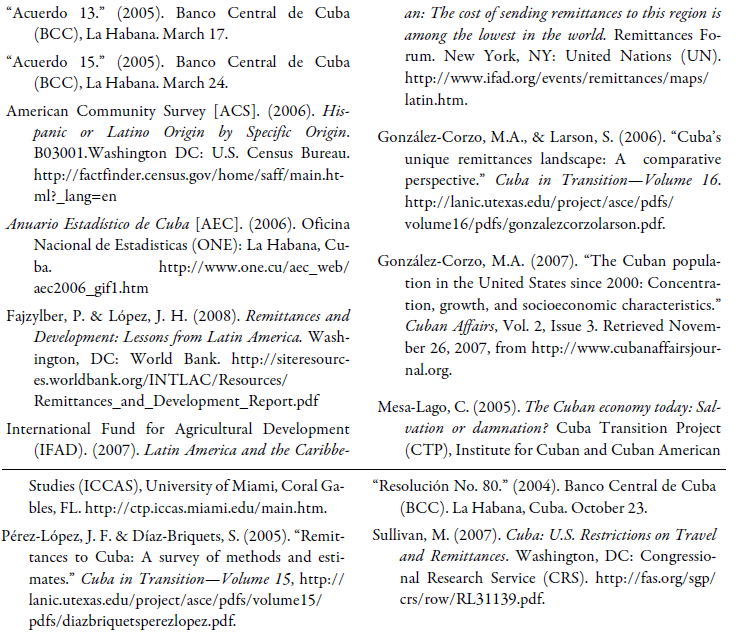 For more on Cuba’s remittances market, see González-Corzo & Larson (2006). 3. The estimates for the Cuban population (the independent variable) were obtained from the most recent (2006) American Community Survey (ACS) Fact Finder report. 4. The regression analysis produced a coefficient of determination (R2) of 0.8996, and an “adjusted R2” of 0.8495, suggesting that there is a strong (positive) correlation between the two variables included in our study. 5. According to the 2006 American Community Survey (ACS), an estimated 148,965 persons of Cuban origin or ancestry lived in Hialeah, FL in 2006. Similarly, in 2006 there were approximately 119,685 persons of Cuban origin or ancestry living in Miami, FL. Combined, the Cuban-origin population of these two Miami-Dade County (FL) municipalities (268,650) represented 17.7% of the total U.S. Cuban population in 2006 (1,520,271). In Hialeah, the Cuban-origin population (148,965) represented more than three-quarters (75.4%) of the Hispanic or Latino population in 2006. Miami’s Cuban population (119,685) represented close to half (48.5%) of the Hispanic or Latino population in 2006. At the county level, the 767,349 persons of Cuban origin living in Miami-Dade County (FL) at the end of 2006 represented an estimated 52.1% of the County’s total Hispanic or Latino population. 6. See Sullivan (2007) for more details on current U.S. Remittances and Travel Restrictions (RTRs) to Cuba.